This Lentil Cranberry Wrap recipe came to me in a flash just as my yoga teacher Mona Keddy was explaining the dedication of our yoga practice. Somehow, just sitting in the Shri Yoga studio gives me clarity of thought and focus that I don’t seem to achieve elsewhere. Is it a magical place? I’m still competing to win the big prize in the Lentil Recipe Revelations Challenge (Contest closes March 19, 2012). Consider this my freestyle entry. As usual, I’m feeling lucky. Help me out, Jittery fans! Amounts are not exact. 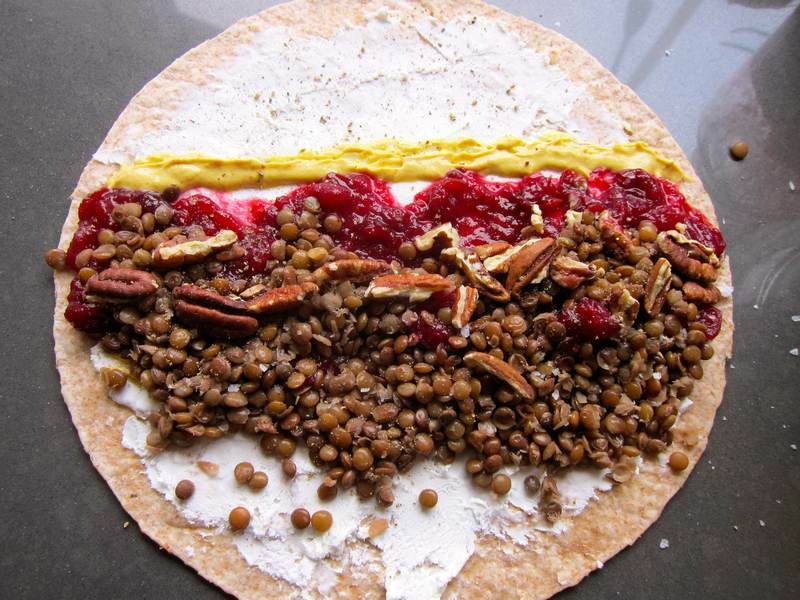 I used 1/3 cup of cranberry sauce, about 1 oz of goat cheese and 1/3 cup of cooked lentils for each wrap. Coat each of the wraps with goat cheese. Spread a line of cranberry sauce down the center, pecans, a line of lentils. Drizzle on 1 teaspoon of olive oil. Top with a mound of arugula. Sprinkle on a little salt and pepper. Roll the wrap slowly, parallel to the line of cranberry. Wrap tightly in parchment paper to hold the ingredients together. Slice in two right through the paper to divide into sandwich wrap halves. Peel the parchment down slowly as you savour, bite by bite. I admit it; I loved watching the Grammys. I’ve become a wholehearted Adele fan. Whitney Houston, may she RIP, was responsible for my marriage; indirectly of course. My friend, Andy Heft, invited me to her Montreal concert in August 1986, and it was that evening he came up with the idea of fixing me up with Marvin, my wonderful husband. Thank you to Jittery Cook fan and important taste tester, Anat Lazar, who came up with the Dijon mustard part of this recipe. Thank you to Kacey Rose Bains, from Epicentre Training, who suggested the roasted pecan addition. It takes a village to raise a Jittery Cook. If you are not crazy about Dijon mustard, try mango chutney instead; as suggested by food savvy Susan Ranger. One good blog knows another. 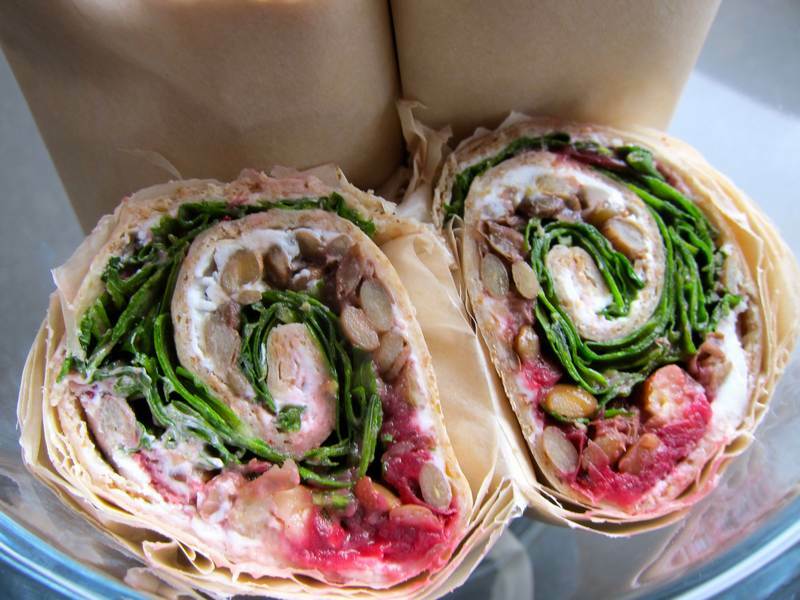 Check out this lentil spinach wrap by The Wooden Spoon. 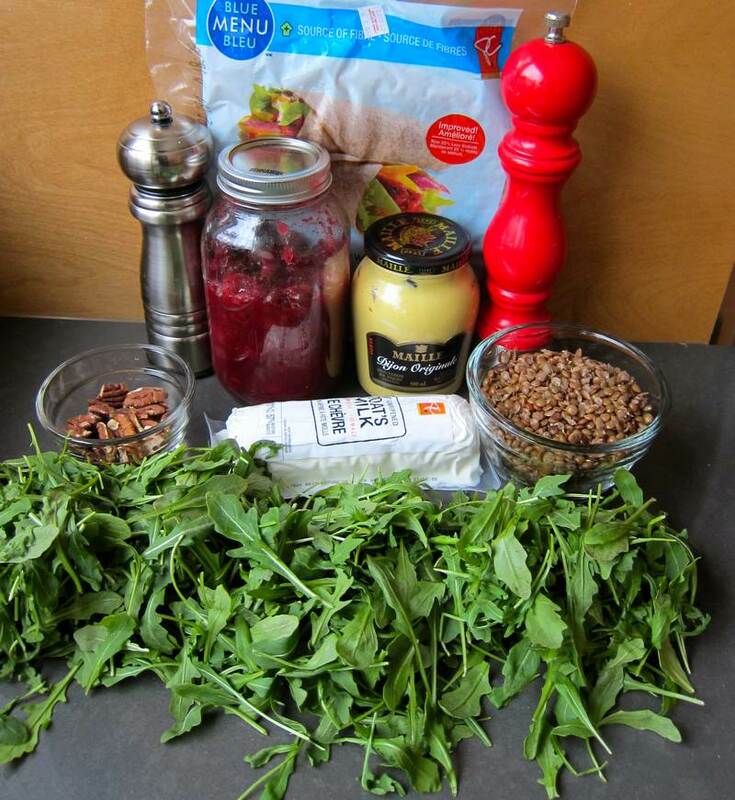 « Italian Sausage and Lentil Stew – Comfort Food! be a raw dish. Well also if you can find raw goat cheese or maybe cashew cheese. This roll tastes amazing. Good enough for breakfast or dinner. Lucky me, I was right here to try it first. No reason to be Jittery about this one. This is a freestyle winner. Yum! Thanks for the suggestions on converting this recipe to raw. Please “like” on http://www.facebook.com/pages/Canadian-Lentils/204564329588016 to make it a winner, and copy and paste your comment to that post as well. This looks absolutely beautiful and yummy. Can’t wait to try it! Please “like” on http://www.facebook.com/pages/Canadian-Lentils/204564329588016 to make it a winner, and copy and paste your comment to that post as well. The photos of the open whole-wheat wrap covered with colourful condiments remind me of the art projects my kids made in kindergarten, by painting pasta shells and gluing them to craft paper. But your version is a feast for more than the eyes! I’m going to serve it to my greedy book clubbers, who are always dieting and moaning about lack of variety and flavour; I’m confident the cranberries, pecans and goat cheese will keep their tongues quiet for a while! Check out #1 on the post to click on “like” on the lentil Facebook page. This is a lentil recipe popularity contest. Vote Jittery!!! Thanks for your support Joanne! Raw dish? As in uncooked lentils?? Oops! Not really raw, more vegan. If you sprout the lentils it would be raw. I haven’t tried this yet, but it looks like a real winner. About to go to Loblaws to get the ingredients. Oh jitterycook, how did I get along before you came out with your blogs. Dorothy, I love having you as a Jittery fan. Hope you love the lentil wrap. another delicious sounding and looking recipe for my vegetarian sons – keep them coming! If they like this they’ll be wanting them regularly. I just make about 10 wraps this week and my family kept asking for more. The cooked lentils keep for about 5 days in the fridge. I will try this tomorrow! It looks amazing! Yummy! Am loving the support Letizzia! I loved it!!!! It was delicious! Will make it for sure!!! Thanks Anat! Love the support! 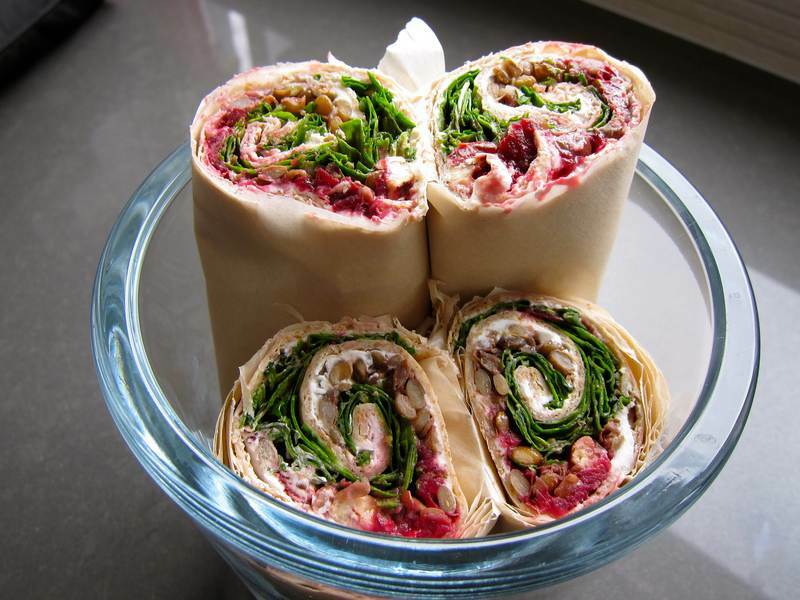 I am thrilled with the Lentil cranberry wrap, because it a very creative way to add more legumes into my diet. I love the presentation and I can’t wait to make it and see how it taste. Let me know how you like it Lina. thanks for liking! Lentils in a wrap! I would have never thought to do that but these look great! Great creative way to use lentils. Thank you Holly for this recipe. Such a delicious wrap. So healthy too. Great looking and great flavour! Thanks!Wish I had a lentil wrap to snack on right now. I am loving tasting your recipes. Our taste buds love your work also! Sending your web page to my sister. Thanks Monique! I’m so glad you are enjoying and spreading Jittery! Hi, Jittery Cook. I made this Lentil wrap for my husband’s lunch. He is a very aesthetic, demanding Orthopaedic Surgeon with great taste, and he loved it. Thanks to you, I am in his good graces once again. Your recipes and comments are easy to follow, and always hit a home-run. Thank you. Your devoted follower. Wow! I’m so pleased! Thanks and hope you keep enjoying jittery recipes.